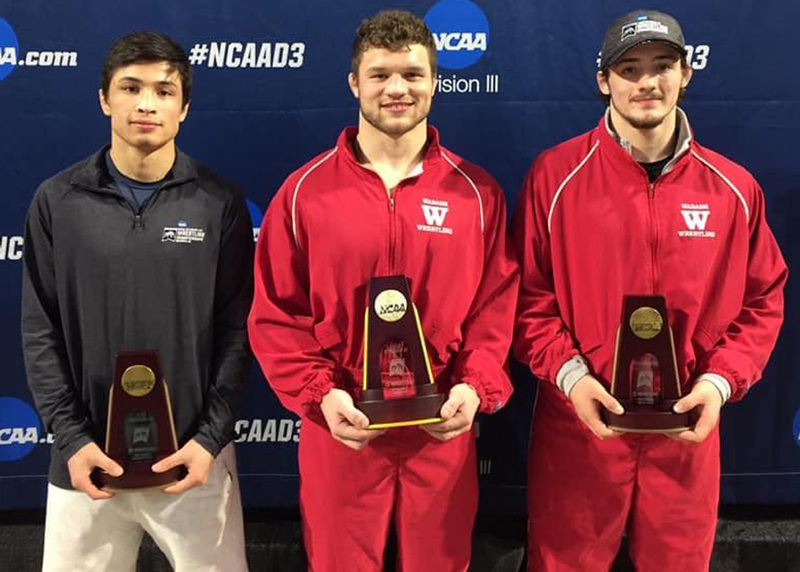 Wabash’s Carlos Champagne, Darden Schurg and Kyle Hatch earned All-American honors after their work at the NCAA Division III National Championships. CRAWFORDSVILLE – For the second straight season, Wabash College wrestler Kyle Hatch has garnered All-American status. Hatch, a sophomore for the Little Giants and a Warsaw Community High School wrestling legend, wrestled to sixth place at 165 pounds to earn All-America honors for the second consecutive season after placing eighth at 157 pounds last season. Hatch won his first three matches at the NCAA Division III National Championships, all by decision. Hatch first defeated Adrian Gonzalez of JWU Providence by a 5-0 score, then topped Luther’s Michael Suarez 6-2 and Loras’ Eddie Smith 3-2. He dropped into the consolation portion of the 165-pound bracket Saturday after suffering a 9-7 loss in overtime in his semifinal bout against top-seeded Lucas Jeske, the eventual national champion in the weight class. Hatch lost in the consolation semifinal by a 10-6 score to Mark Choinski from Wisconsin-Oshkosh in the consolation semifinal before losing 9-4 to Nicholas Bonomo from Wisconsin-Whitewater in the finals. Hatch finished his sophomore campaign 32-6. Wabash collected three All-America awards for the second consecutive season with Hatch, Darden Schurg – the 172-pound national champion – and 125-pounder Carlos Champagne, who placed seventh. The Little Giants have produced at least one All-American every year since 2011.